Edward "Eddie" Regan Murphy (born April 3, 1961 in Brooklyn, New York) is an American stand-up comedian, actor, writer, singer and producer who has won the Golden Globe Award in 2006 and was nominated for an Academy Award in 2002. He has received Golden Globe Award nominations for best actor in a comedy or musical for his performances in Beverly Hills Cop, Beverly Hills Cop II, Beverly Hills Cop III, Trading Places, and The Nutty Professor. In 2007, he won the Golden Globe for Best Supporting Actor for his portrayal of soul singer James "Thunder" Early in Dreamgirls, and received a nomination for the Academy Award for Best Supporting Actor for the same role. Murphy's work as a voice actor includes Thurgood Stubbs in The PJs, Donkey in the Shrek series and the dragon Mushu in Disney's Mulan. In some of his films, he plays multiple roles in addition to his main character, intended as a tribute to one of his idols Peter Sellers, who played multiple roles in Dr. Strangelove and elsewhere. 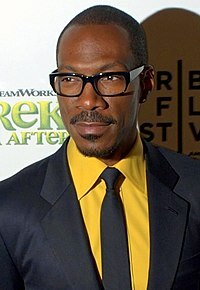 Murphy has played multiple roles in Coming to America, Wes Craven's Vampire In Brooklyn, the Nutty Professor films (where he played the title role in two incarnations, plus his father, brother, mother and grandmother), Bowfinger and 2007's Norbit. Murphy's brother was comedian and screenwriter Charlie Murphy (died in 2017) who wrote the screenplay for Norbit and Vampire in Brooklyn. He was a usual member on Saturday Night Live from 1980 to 1984, and has worked as a stand-up comedian. He has worked a little as a singer too, having a number 87 on the uk singles chart and number 2 on the billboard hot 100 with Party All The Time  and a uk singles chart number 64 with I Was A King. In 1992 Murphy acted in the music video for Michael Jackson's single "Remember the Time". In 1993 Murphy released a song with Michael Jackson called "Whatzupwitu". It was voted by MTV viewers in 1999 as the third worst music video of all time. ↑ "Eddie Murphy's Golden Raspberry Nominations". razzie.com. Retrieved August 29, 2010. This page was last changed on 7 May 2018, at 01:57.